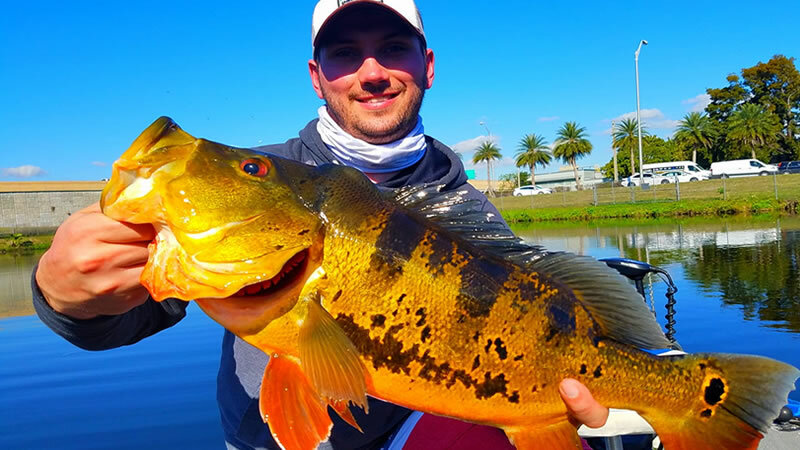 Have you ever wanted to catch a Peacock Bass? Did you know you could catch them in the USA? Miami, FL is an excellent and beautiful destination to catch peacock bass. They may not weigh 20 pounds but they put up an amazing fight. Get your hands on a colorful exotic with our local experts on your next visit to Miami. 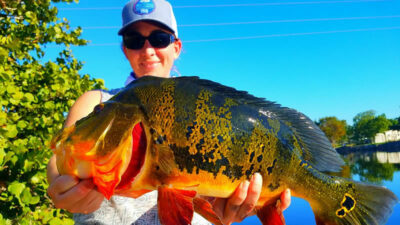 Our local experts have years of experience fishing for peacock bass. 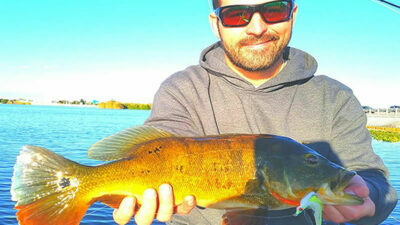 South Florida is the ultimate fishing destination and they want to show you a great time. When you are traveling to Florida, make sure you get the full experience. Hop on board with one of our local experts for a trip of a lifetime. Captain Robert Miley had the pleasure of fishing with Frank. Frank was looking to explore Miami’s Airport Lakes for peacock bass. He loves to fly fish and always wanted to catch a peacock bass on a fly. It was not long into his fishing adventure that Frank got what he was looking for. When the weather is stable, warm, and the sun is shining, peacock bass fishing in Miami is fantastic. When cold fronts and wind moves in the bite can be slower but if you have patience, you will get around some quality peacock bass. Frank experience a cooler morning with winds making artificial fishing very interesting. After moving around and letting the day warm, the peacock bass started to bite. Frank caught a nice 2-pound peacock bass on a Lefty Kreh Clouser Minnow with a weighted head. The bass was suspended and did not want to surface for the flies. Frank still had a great time on the water and is looking forward to his next adventure on the water. Captain Miley will get him around even better fish. Just shortly after this fishing trip, Captain Joe Gruny had the pleasure of fishing with a wonderful family on a three boat fishing charter. Captain Kirk Osborne and Tim Nichols joined him on this fishing trip. This family was traveling from Michigan looking to catch some quality peacock bass. Live bait came in strong and produced some great fishing. Everyone had a fantastic time and everyone was smiling from ear to ear. The bite was on and the bass was biting. 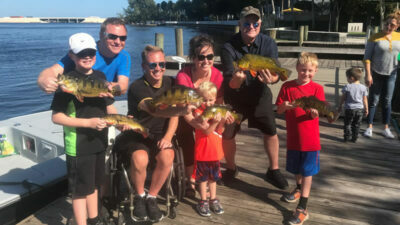 This amazing family caught over 20 peacock bass with the biggest weighing between 2-3 pounds. They are looking forward to their next adventure out in Miami on their next visit. Captain Joe, Kirk, and Tim will be there to assist in creating more memories of a lifetime. outdoors and catch some Florida bass. These friends were in-store for one EPIC day of peacock bass fishing. Every time you travel to this beautiful destination, this could occur. You never know what is going to bite the end of your line. After moving around to different spots, Captain Miley found some trophy peacock bass. Nicholas, Dyna, and Dan caught over 10 peacock bass. They caught two trophy fish weighing in at 6.70 pounds and 6.5 pounds. After landing these giants, Dan landed a 3.5 pounder. Even though the bite was slower, these fish made up for it all. According to Nicholas, Dyna and Dan, this was their best fishing trip ever, especially for peacock bass. Conditions were just right to provide them an excellent time. Captain Miley is looking forward to their next adventure! The last stop on this tour is the Lake Ida Chain of Lakes in Palm Beach County. Captain Miley had the pleasure of fishing with Darrell and his brother Jerry. They were traveling from Oklahoma looking to spend some time in the outdoors. A Peacock bass fishing trip in Palm Beach, FL was the perfect activity. Darrell and Jerry explored Lake Ida for 6 hours. They were visiting Florida to watch some football but had to get out on the water as well. The fishing was slow due to colder weather but they managed to catch some decent numbers. These brothers landed 10 largemouth bass along with 3 quality peacock bass weighing between 3-4 pounds. These gentlemen will be back for more action and Captain Miley is looking forward to getting them back on the water. 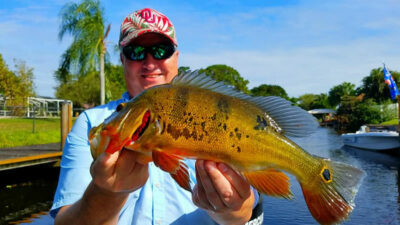 All across South Florida, the peacock bass are biting. When the weather gets really warm, the action should be incredible. Make sure you experience this awesome family friendly fishing adventure on your next visit. You will not regret getting your little ones or friends on a hard-fighting peacock bass. We look forward to being your experts and getting you on the water next time!